The time it takes you to recover from an upper arm and elbow fracture depends on the severity of the break. However, while the bones usually take six to eight weeks to knit together, it may take up to a year for the arm to fully return to normal. The olecranon, or pointy part of your lower arm bone (ulna), is a common site of an elbow fracture, which usually occurs when you fall on a bent arm, says the Academy of Orthopaedic Surgeons. Your humerus rests in the olecranon, so it, too, can be affected by this injury. 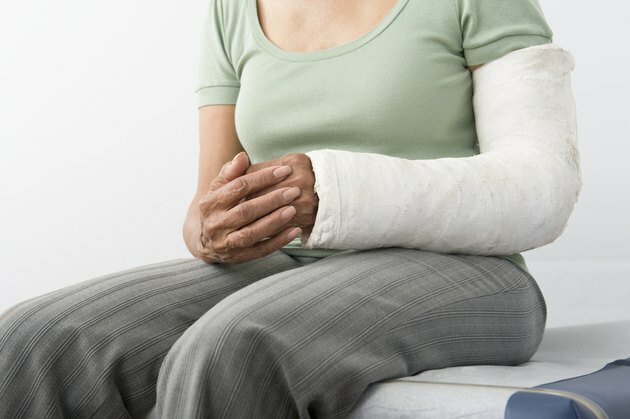 A broken arm and elbow essentially means you have broken both your upper and lower arm bones and is, therefore, a particularly serious fracture. As soon as the break occurs, immobilize the arm and seek medical attention. If you have sustained only a partial fracture — that is, the bones haven't completely snapped — your doctor may be able to treat the injury without surgery. Most humerus fractures can be treated without surgery by immobilizing the arm in a sling. A splint may also be used to stabilize your elbow joint, according to the American Academy of Orthopaedic Surgeons. You are likely to need surgery if the bones have dislocated as well as fractured and/or pieces have bone have pierced the skin. Once you can move your arm without pain, your doctor will prescribe strengthening and mobility exercises to help restore the arm to full function. These exercises may include arm curls and wrist extensions for strength, according to the Sports Science Orthopaedic Clinic. Stretching your biceps, triceps and wrists will help improve range of motion. If you have had surgery, the stitches are usually removed within about two weeks, according to the American Academy of Orthopaedic Surgeons. But that isn't a signal for you to return to regular activities. Depending on which arm has been injured, you may be restricted from driving until your range of motion has improved and you will be advised to avoid any heavy lifting for at least six weeks after the injury and/or surgery, according to the American Academy of Orthopaedic Surgeons. In some cases, you may not make a complete recovery in that you will be unable to completely straighten the injured arm. How Long After Breaking an Arm Can I Resume Weightlifting?